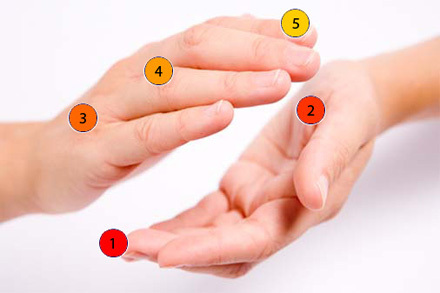 Where do you think the most germs are located on your hands? As studies have shown, our fingernails house the highest level of pathogens on our hands. The area under the fingernail has at least 75 times more microorganisms per density than anywhere else on the hands. Researchers have known for long time that the hands are the primary perpetrator to the transmission of microorganisms. Clinicians have thus educated on the importance of handwashing, to restrict the spread of germs. Even with frequent handwashing with soap and water, it is nearly impossible to eliminate the presence of pathogens. For this reason, using antiseptic agents, especially alcohol-based rub or gel, are highly recommended to reduce the density of microorganisms on the hands. Be sure to rub underneath the fingernails each time you wash your hands or apply alcohol-based antiseptic. - Armitage, P. Statistical methods in medical research. Blackwell Scientific Pulblications, Ltd. Oxford. 1971. - McGinley K, Larson E, Leyden J. Composition and Density of Microflora in the Subungual Space of the Hand. Journal of Clinical Microbiology. 1988;26(5):950-953. - Price, P. The bacteriology of normal skin: a new quantitative test applied to a study of the bacterial flora and the disinfectant action of mechanical cleansing. The Journal of Infectious Diseases. 1938;63:301-318. Are Alcohol-free Hand Sanitizers Better Than Alcohol-based Hand Sanitizers? At Hand Hygiene, we seem to receive more questions surrounding the nature of alcohol-free hand sanitizers. Is alcohol-free better? Is it safer? Why should clinicians even consider using an alcohol-free sanitizer? In this article, the Hand Hygiene team will outline the pros and cons of using alcohol-free hand sanitizers compared to alcohol-based alternatives. 1. Alcohol-free products are safer to use. 2. The formulation in alcohol-free sanitizers is as effective as ethanol in killing microorganisms. 3. Repeated use of alcohol-based sanitizers is detrimental to the hands as essential oils are stripped away from the skin. Are alcohol-free hand sanitizers safer to use? Alcohol-based hand sanitizers have high concentrations of alcohol since the Food and Drug Administration (FDA) recommends sanitizers should contain 60% to 95% ethanol or isopropanol to effectively kill germs on the hands. Looking at the high alcohol content required, it is not surprising to see that most alcohol-based antiseptic products are highly flammable. Unfortunately, the media took it upon themselves to hype this concern causing the general public to raise concerns. Contrary to what the media may think, the FDA, World Health Organization (WHO), as well as the Association for Professionals in Infection Control and Epidemiology (APIC) continue to recommend the use of alcohol-based hand sanitizers in hospital settings. To this day, the FDA does not recommend any alcohol-free hand sanitizers for use as an antiseptic agent. As for concerns over alcohol-based antiseptic causing fires in healthcare facilities, caution is required when planning to install wall-mounted sanitizer dispensers within hallways and rooms. Hospitals must adhere to the local fire department’s regulation on the placement of such dispensers. Given the caution placed in planning the installation of wall dispensers, few hospital administrators voice concerns over the possibility of a fire. Economically, the amount of money saved by preventing the spread of infections far outweighs the possibility that a fire can start due to a hand sanitizer bottle catching on fire. Although the healthcare community does not have to worry too much regarding the safety of alcohol-based sanitizers, arguments for caution may not be without merit in an environment where children are present. Adults should always use caution regarding where to store alcohol-based hand sanitizers. The prime concern with children’s use of alcohol-based sanitizers is possible ingestion. Most antiseptic dispensers are easy to open making it simple for children to access. Since most alcohol-based hand sanitizers have high concentrations of ethanol, alcohol poisoning is very possible if a child were to consume any. Most sanitizers have a distinct, disgusting taste to prevent people from consuming, but in the event of accidental ingestion, contact the Poison Control Center or your local physician. It is our opinion that the possible “dangers” of alcohol-based hand sanitizers have been blown out of proportion and would not warrant a transition to alcohol-free sanitizers in the healthcare industry. The benefits of killing germs far outweigh the risks. As for replacing the current standards, if alcohol-free sanitizers are as effective as alcohol-based sanitizers, it does not hurt to consider the use of such an alternative in the interest of increasing the safety in healthcare facilities. If you are considering switching to alcohol-free sanitizer, the key question on your mind will be, “what is the efficacy of alcohol-free hand sanitizers?” In other words, how well will an alcohol-free agent kill microbes? The answer: it depends on the agent used. Any comparison of efficacy rate should be done with an appropriate control: ethanol or isopropanol. There is no question on effectiveness of ethanol or isopropanol regarding efficacy rate of killing microbes. First of all, alcohol is known to kill a wide range of pathogens which include MRSA, salmonella, and HIV. This is especially important in a hospital environment because both patients and healthcare workers have high exposure to numerous bacteria and viruses. In addition to killing a wide range of bacteria, virus, and fungi, alcohol has one of the highest killing rates compared with other agents. Efficacy of antiseptic agents is measured in logarithmic units. The higher the concentration of alcohol, the better the kill rate will be. In addition to the efficacy level in terms of percentage, ethanol and isopropanol kills pathogens quickly in a matter of seconds. The hospital is a fast-paced environment and clinicians cannot afford to wait around for an antiseptic agent to disinfect their hands. For this reason, hand antiseptic agents should be able to kill microorganisms quickly. Finally, alcohol has the added benefit of providing persistence and residual protection. Simply put, after application of alcohol-based hand sanitizers, the clinician is protected for a period of time. For this reason, alcohol hand rubs are widely used in surgical units where germ-free environments are a necessity to the protection of the healthcare professionals and patients. To sum it up, alcohol has been the preferred antiseptic agent in hand sanitizers because of its ability to kill a wide range of pathogens quickly and effectively while providing residual protection. For alcohol-free hand sanitizers to replace alcohol-based sanitizers, the antiseptic agents used should be just as good, if not better, than alcohol on efficacy. The problem of analyzing antiseptic agents used in alcohol-free hand sanitizers is the lack of standardized agents. New companies are coming up with unique formulas claiming how their product is better making analysis inefficient. This is one of the primary reasons it is difficult for the Center for Disease Control and Prevention (CDC) to give their “stamp of approval” on any alcohol-free hand sanitizers. Without such standardization on the acceptable antiseptic agent found in alcohol-free hand sanitizers, it is difficult for the CDC to give guidelines on the volume of antiseptic agents that should be used because the efficacy rate may not necessarily be proportionate to volume as ethanol is. So how does one check for the efficacy of a particular alcohol-free hand sanitizer brand? There is no easy way, but to start off, ask the manufacturer for data on efficacy rate and clinical trials, if any. Once you have the data, scrutinize it by comparing the data with the efficacy of alcohol. If you are seriously considering the use of an alcohol-free sanitizer, this homework is necessary because there is no alcohol-free sanitizer product that is recommended for use by the CDC. Are alcohol-based hand sanitizers detrimental to healthy hands? It is true that applying alcohol repeatedly on your hands can be damaging to the skin. Every time alcohol is applied and you rub your hands together, natural oils that retain moisture on the hands are stripped away. However, this phenomenon is not as bad as it seems. Although the natural oils strip away when hand sanitizer is applied, the skin reabsorbs the oils as the alcohol dries off. In addition, most alcohol-based hand sanitizers contain emollients that help the skin retain moisture to minimize any damage that happens. In fact, washing your hands with soap and water is more detrimental to the condition of the skin versus using alcohol-based hand sanitizers because when you wash your hands, the natural oils from your skin are stripped away. Reading this article, you might get the sense that the general recommendation is to not use alcohol-free hand sanitizers as a substitute for alcohol-based. This is not because all alcohol-free hand sanitizers are inferior, but because there is not enough conclusive evidence to suggest that there is an alternate antiseptic agent that can be used as a substitute to alcohol-based antiseptic agents for hand antisepsis products within the healthcare industry. Let’s take a scenario where a lab technician accidentally douses your hand with E. Coli and were given a choice of hand sanitizers to choose from. You can bet that I would instinctively reach for the alcohol-based hand sanitizer with the highest alcohol concentration available. We know alcohol has one of the highest efficacy rates of killing harmful pathogens. In addition, there is plenty of research to back up this claim. Why would you want to risk your health by using a product you were not sure of? Although this question raises serious doubt on the use of alcohol-free hand sanitizers, we recognize that there may very well be a product out there that is acceptable for use in hospitals. If a manufacturer’s finds their product to be comparable or superior to alcohol, the next step would be to share this knowledge with the research community for in depth analysis. In depth analysis would include in vivo testing in addition to in vitro testing to see how the product’s efficacy rate changes when applied on the hands. Also, the long-term effects of the product used should be analyzed to determine how prolonged use affects individuals. Once this data becomes available to support alcohol-free hand sanitizers, the final step would be to make sure the product is accessible. The product should be cost effective like current alcohol-based hand sanitizers. At this time, Hand Hygiene agrees and support’s CDC and WHO’s recommendation of using alcohol-based hand sanitizers within hospitals. As alcohol-free hand sanitizers begin to standardize and as more data become available, it will be worthwhile to revisit whether an alcohol-free hand sanitizer can become an acceptable substitute to alcohol-based hand sanitizers. - Pittet D, Rudolph P, Kramer A. Interscience Conference on Antimicrobial Agents and Chemotherapy. Interscience Conference on Antimicrobial Agents and Chemotherapy. 2001 December 16-19; 41: abstract no. K-1338. - Boyce J, Pittet D. Guideline for Hand Hygiene in Health-Care Settings. Centers for Disease Control and Prevention. 2002 October 25; 51(RR16); 1-44. - Eitzen HE, Ritter MA, French MLV, Gioe TJ. A microbiological in-use comparison of surgical hand-washing agents. The Journal of Joint Bone and Surgery. 1979; 61-A: 403-6. - Heeg P. Does hand care ruin hand disinfection? Journal of Hospital Infections 2001; 48 (suppl A): S37-S39.